Gary Locke's side come out on top after a thriller at Tynecastle. Hearts once again needed penalties as they finally defeated Queen of the South to book their place in the quarter-finals of the League Cup. An epic third round tie remained all-square after 90 minutes and extra-time with spot-kicks eventually separating the two sides. Jamie Hamill, Chris Mitchell and Michael Paton all failed to convert from the penalty spot, with Dale Carrick's strike sparking celebrations in the home camp. 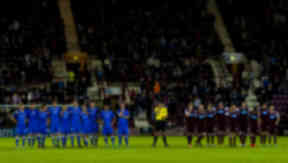 Hearts also needed penalties to overcome Raith Rovers in the last round. Kevin McHattie had fired the Jambos into the lead but his opener was cancelled out by Ryan McGuffie, with the scoreline level at half-time. The Edinburgh side nudged in front again through a Hamill penalty only for Paton to haul Queens back in the match and force the third round tie into extra-time. Danny Wilson then netted just two minutes later but, unbelievably, the visitors restored parity again thanks to Chris Higgins. The home side made one change following their defeat to Ross County at the weekend for the visit of the Scottish Championship outfit. 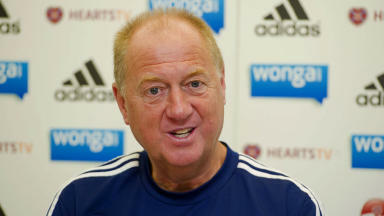 Gary Oliver was drafted into the side in place of the injured David Smith, as the Jambos attempted to return to winning ways after three straight losses. Queens headed to Tynecastle aiming for another top-flight scalp having dumped St Mirren after extra-time in the last round but headed home disappointed on this occasion.